George Douglas Campbell, 8th Duke of Argyll (1823-1900), Politician, Lord Privy Seal and Secretary of State for India and writer on science, religion, and politics. Sitter in 32 portraits. George William Frederick Villiers, 4th Earl of Clarendon (1800-1870), Diplomat and politician; Foreign Secretary and Chancellor of the Duchy of Lancaster. Sitter in 16 portraits. Robert Monsey Rolfe, Baron Cranworth (1790-1868), Judge. Sitter in 14 portraits. Sir George Grey, 2nd Bt (1799-1882), Home Secretary. Sitter in 14 portraits. The coalition ministry, under the leadership of the Earl of Aberdeen, came to power in 1854. 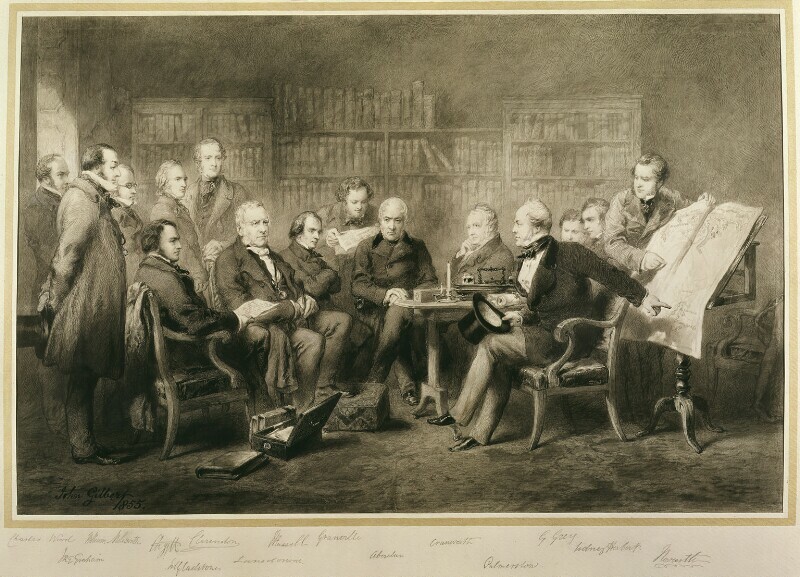 This engraving shows Aberdeen's cabinet deciding upon the expedition to the Crimea in the early months of that year. Palmerston, on the right, is seen pointing at the town of Balaclava on a map held open by the Duke of Newcastle, while Gladstone, on the left, holds a letter on his knee.